Melbourne is the second largest city in Australia. It is the capital of Victoria, which is a state in the south-east of Australia. The population of Melbourne is 4.9 million. Melbourne is a multicultural city (it welcomes people and cultures from all over the world). It is famous for its trams (small short trains). The centre of Melbourne is around a river called the Yarra River. Melbourne also has many big parks and gardens and some beaches. There are many things to do in Melbourne. Visitors in Melbourne can go to museums, look at art, eat food at restaurants, go to shops and visitors can enjoy of international events like Australian Open and Formula One both in the early year. Melbourne has been the winner of the Economist's 'World's most liveable city' award for the 7th time in a row (Winner from 2010 - 2017). There is a lot of industry (factories) and commerce (buying and selling) in Melbourne. 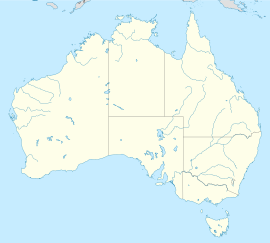 Many of Australia's largest companies and many large companies from other countries work there. It is home to Australia's largest seaport. There are a number of universities (the University of Melbourne, Monash University, Deakin University, Victoria University, La Trobe University, RMIT University, Swinburne University and the Australian Catholic University). Much of Australia's automotive (car) industry is there, for example the engine maker "Holden", and "Ford" and "Toyota" car builders, Although all three of these companies have announced plans to move there manufacturing plants overseas with Ford already shutting down its manufacturing plant in Broadmeadows. Melbourne was founded in 1835 by John Batman and John Pascoe Fawkner. In 1851, some people found gold near Melbourne. Melbourne grew very quickly because people came from all over the world to look for gold. At the end of the 19th century, Melbourne was called "Marvellous Melbourne" ("marvellous" means "wonderful"). Melbourne was the biggest and most important city in Australia for many years, but now Sydney is bigger (but not more important). The first Australian government was in Melbourne from 1901 until 1927 when it moved to Canberra. 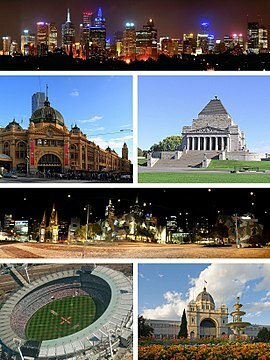 Many people from different countries live in Melbourne. In fact 43% of the people living in Melbourne were born outside Australia or have parents from another country. All together people from 233 countries live in Melbourne and people with 116 different religions. 1956 - The Olympic Games were in Melbourne. Australia uses three main different time zone. Wikimedia Commons has media related to Melbourne. ↑ "3218.0 – Regional Population Growth, Australia, 2015–16". Australian Bureau of Statistics. 28 July 2017. Retrieved 31 October 2017. ERP at 30 June 2016. ↑ "3218.0 – Regional Population Growth, Australia, 2015–16: Population Estimates by Statistical Area Level 2 (ASGS 2016), 2006 to 2016". Australian Bureau of Statistics. Australian Bureau of Statistics. 28 July 2017. Retrieved 26 October 2017. Estimated resident population, 30 June 2016. ↑ "Great Circle Distance between MELBOURNE and CANBERRA". Geoscience Australia. March 2004. ↑ "Great Circle Distance between MELBOURNE and ADELAIDE". Geoscience Australia. March 2004. ↑ "Great Circle Distance between MELBOURNE and SYDNEY". Geoscience Australia. March 2004. ↑ "Great Circle Distance between MELBOURNE and BRISBANE". Geoscience Australia. March 2004. ↑ "Great Circle Distance between MELBOURNE and PERTH". Geoscience Australia. March 2004. ↑ "A tale of three cities: Populations soar in Melbourne, Sydney and Brisbane". ABC News. 2018-04-24. Retrieved 2018-08-30. ↑ Cultural Heritage Unit, Department of History. "Gold in Melbourne - Concept - Electronic Encyclopedia of Gold in Australia". www.egold.net.au. ↑ "Monthly climate statistics". Bureau of Meteorology. Retrieved 30 March 2012. This page was last changed on 4 April 2019, at 16:36.